Not along ago, we splurged on real vanilla beans for making ice cream. When I used a bean to make a custard base, the pod was cooked in the custard mixture; I didn't save that pod (although Nicole says it can be done). But when I used a vanilla bean to make Philadelphia-style ice cream, I just scraped out the seeds and didn't need the pod for the recipe. 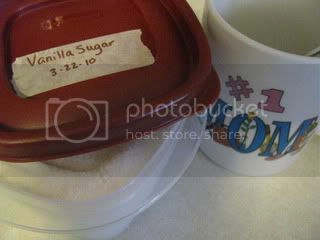 Not wanting to waste anything, I remembered that my sister had mentioned making vanilla sugar. I placed the scraped bean into a small Rubbermaid container and filled it with sugar. Occasionally I shook the closed container to break up the lumps and distribute the flavor. Within a day or two, the sugar was thoroughly scented with vanilla. This vanilla sugar is very, very delicious in coffee! I haven't tried it for anything else yet, but it makes good coffee taste even better. And it's my understanding that the sugar can be replenished without replacing the vanilla bean; I'm guessing that the flavor will be milder or will take longer to transfer to the sugar. Visit Kristen for more Works for Me Wednesday. What a great idea! This would also make oatmeal taste just a bit better. I'm going to have to try it! Love flavored coffee, and vanilla is a nice choice. thanks for the tip Melissa. It's amazing how easy it can be to take something and naturally improve it. That's a great idea.